Michalis Kalomiris is seen crossing the finish line of the Athens Marathon at the Panathenaic Stadium last year. He couldn’t believe his eyes. He looked at the list again to make sure he wasn’t mistaken. But there it was, his name among the runners who qualified for the marathon at the Rio Olympics this summer. It was early May when lawyer Michalis Kalomiris saw this unexpected piece of news while reading a website dedicated to athletics. He had worked hard in the preceding months to improve his performance by squeezing in training sessions before and after work, but he did not expect to qualify for the Olympics – particularly as his time was nearly 10 minutes slower than that needed to pass. Without realizing, the 30-year-old had in fact qualified for the Games in March 2015, when he ran the Rome Marathon in 2 hours and 29 minutes. The limit for men in the Olympics is supposed to be 2 hours and 19 minutes, but the regulations of the International Association of Athletic Federations (IAAF) state that an athlete qualifies regardless of timing if they finish in the top 10 of a Gold Label event. The Rome Marathon last year was one such event as it met the IAAF criteria for the Gold Label, including having at least five elite men and five elite women of four different nationalities at the starting line. Elite men are those with times of 2 hours and 10 minutes or under and women with 2:28:00. When the news of Kalomiris’s qualification finally emerged, a small war broke out in the Greek running community on social media. 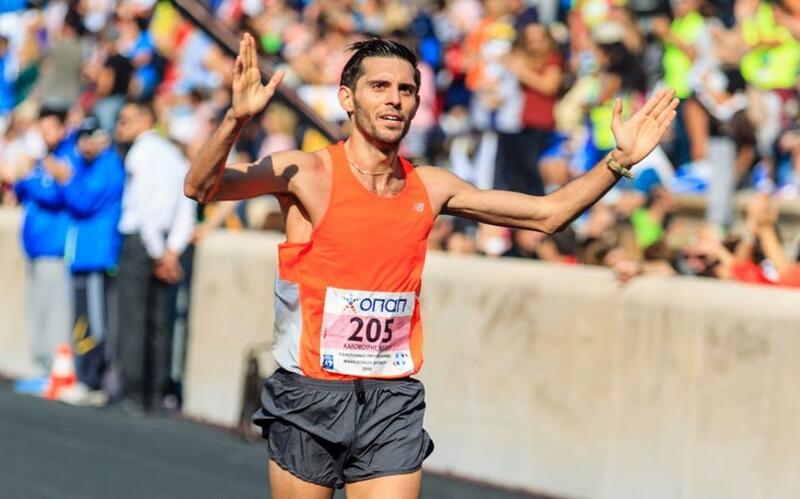 Some thought the decision unfair, arguing that there are faster marathoners in Greece (Kalomiris finished fifth in the National Marathon Championship). Others expressed support, viewing his qualification as a victory for all amateur runners. Kalomiris says he is an “amateur training at sub-elite level.” For the past four years, he has been working at a legal firm in Athens, running at a sports center in the suburb of Aegaleo after work or waking up early in the morning to get some early training in. He runs in different parts of the capital on the weekends, choosing routes in areas such as Anavryta and Filothei. Depending on where he is in his training regimen, he will cover between 110 and 200 kilometers a week. When he has a court appearance outside Athens, he always takes his running shoes along. “When you really like something a lot, you find a way of fitting it into your life,” he tells Kathimerini. Kalomiris’s qualification comes at a time when running is enjoying particular popularity in Greece and amateur races have increased sixfold in 10 years. In 2005, the Athens Marathon had around 800 Greek runners; last year, there were 7,500 at the starting line. Kalomiris’s father was the president of the Run for Health Association of Athens (SDYA), a pioneer in mass sports that also supported the Athens Marathon back when it was sparsely attended. Kalomiris started running at a young age but went though a four-year lull before returning to vigorous training in 2012. “I had toned down the pace and intensity of my life. I was sort of run-down,” he explains. The other Greeks running in the Rio Games marathon this August are Sofia Riga, Rania Rempouli and Panagiota Vlachaki among the women, and, among the men, Christoforos Merousis (every country can send up to three runners in each category). Kalomiris is now in Karpenisi, central Greece, where he is focusing on his training. “When I asked if I could take three months off at the office, they were ready to support me. It was very important because it spared me the anxiety that I was letting them down,” he says. Kalomiris’s performance does not match that of professional runners. The fastest to qualify for the Rio Olympics is a runner from Kenya with a time of 2:03:05. For the lawyer from western Attica, though, what counts is “the dream of participation” and the effort for improvement. “I would like to think that this story makes everyone involved in running believe more in themselves and keep up the effort,” he says.